Pond filters | FAQs | Site Map | Product Catalog | Bookmark this site! Click here to see our selection of Pond filters. Pond filters do, indeed, filter out some physical debris as water passes through them. However, contrary to popular thought, this is not their main purpose. They actually do much more to keep the water of your pond healthy (Note: do not equate "healthy" with "clear." You can have clear water that is actually quite unhealthy for fish - it can be full of invisible toxins). The media within each filter has a large surface area for beneficial bacteria to live. These bacteria break down invisible toxins caused by the breakdown of organic material (like excess food, fish waste, and leaves). They change ammonia into nitrite. Another bacteria breaks nitrite into nitrate. Plants then absorb the nitrate. Realize that when you first start using a biological pond filter it may take a few months for the beneficial bacteria to build up enough in the filter media. If you do not have fish, you may not need to use a pond filter. Here at Pond Depot, we have an excellent assortment and selection of pond filters. Find the perfect filter for your pond! 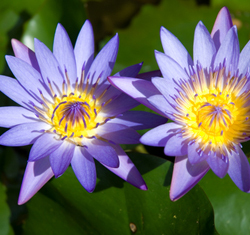 Be sure that your pond stays clean and beautiful and in excellent health by using one of our pond filters. Go ahead and browse through our great selection. While pond filters are not going to keep your pond crystal clear, they do serve an important purpose. They break down fish waste, reduce algae growth (pond filters facilitate this by removing nutrients), trap suspended particles from the water, and protect the pump from debris. There are multiple types of filters available. There are submersed filters, intake filters, in-line filters, and external filters. You will not only need to decide which type of pond filter that you need, but also the right size. Here at Pond Depot, we can help you pick out the right pond filter.